“In the Talmud, the external term representing the hidden word of power, by whose virtues a new world might be. This word is lost to the human race, although even sounds approximating it has a magic power and can give to whoever pronounces them dominion in the spirit world. Some of the old rabbis believed that the word of power contains 12 letters, others, 42, and yet others 72, but these are the letters of the divine alphabet, which God created from certain luminous points made by the concentration of the primal universal light. Shemhamphorash is, in fact, the name of this word. 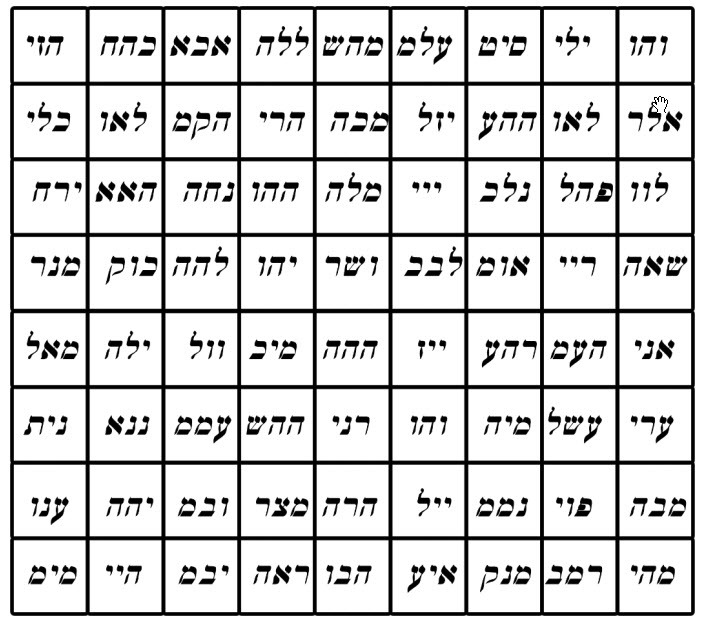 In the Kabala, the Shemhamphorash, or 72 syllable name of God, is related to three verses of the Hebrew Bible, Exodus 14, 119-21. Each of these verses, in Hebrew, contains 72 letters. If one writes the 72 letters or verse 19 in the correct order, and under them write the letters of verse 20 in a similar manner in reverse order, and then the letters in verse 21 in correct order below the first two, one creates 72 three-letter names. By adding either AL or IH to these names the names of the 72 angels of Jacob’s ladder were created. 20 And it came between the camp of the Egyptian and the camp of Israel, and it was a cloud and darkness to them, but it gave light by night to these: so that the one came not near the other all the night. 21 And Moses stretched out his hand over the sea, and the LORD caused the sea to go back by a strong east wind all that night and made the sea dry land, and the waters were divided.